Cable Matters Gold-Plated Mini DisplayPort to HDTV cable is an indispensable companion for your Mac, PC, and tablet equipped with Mini DisplayPort. 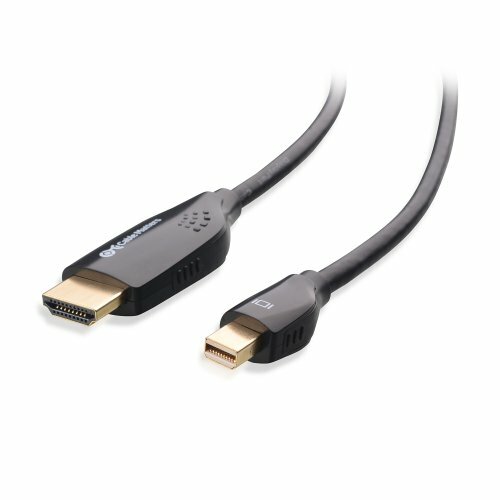 Directly connect your laptop or tablet to an HDTV for high-definition video (1080p) and audio streaming or to an HD monitor/projector without a separate cable. Low-profile connector with molded strain-relief design increases the cable durability. Ergonomically designed easy-grip treads make plugging and unplugging a breeze. The combination of gold-plated connectors, bare copper conductors, and foil & braid shielding provides superior cable performance. This adapter is not compatible with Thunderbolt 3 port.